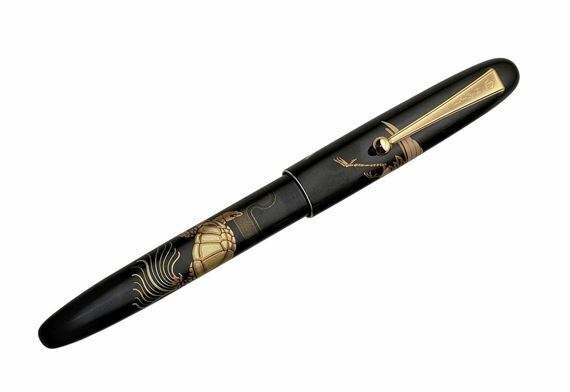 Order your Namiki Nippon Art Crane and Turtle Fountain Pen today from FahrneysPens.com. Fine Pens, Refills & Luxurious Gifts – great prices & fast shipping. The exquisite Nippon Art Crane & Turtle fountain pen from Namiki highlights the Japanese talent for transforming traditional scenes from nature into striking fantasies. The technique of Taka Maki-e is used apply the designs to the rich, black lacquer barrels. The Nippon Art fountain pen has a solid 14K gold nib and uses cartridges or converter. The amazing Crane & Turtle design represents good fortune and longevity. Shipped in an oriental wood box. Uses cartridges or converter.